Sarah is 11 years old and goes to school in the Nyirarukobwa Primary School, together with about 1400 other kids. She tells me that she joined this school this year because it has a very high success rate for the National Exam. Sarah said to me: ‘I want to go to boarding School’, which is what will happen when she passes the exam and go to Secondary school. She is one of the 700 plus children who joined the Nyirarukobwa School over the last 3 years (yes the number of kids just doubled!!) because of its high exam success rate. Apart from a very dynamic and forward thinking school principal and very passionate teachers, the school received a grant through the Internet Society Grants programme in 2013 to get the school connected to the Internet and to get some computers and printers to train the teachers and teach computer classes to the children. Robert Birushyabagabo (right), a member of the teaching staff, addressing an Internet Society delegation at Nyirarukobwa Primary School in the Eastern Provice of Rwanda on 11 May 2017. Birushyabagabo teaches ICT and maintains the school’s computers, which were donated by the Internet Society. For three years the school managed to not only give computer classes to the students but the teachers also actively used the computers to prepare their classes, the exams, assignments, revisions etc. Without printed assignments and tests the main knowledge transfer happens through the use of a massive blackboard and a lot of memorising and repeating. 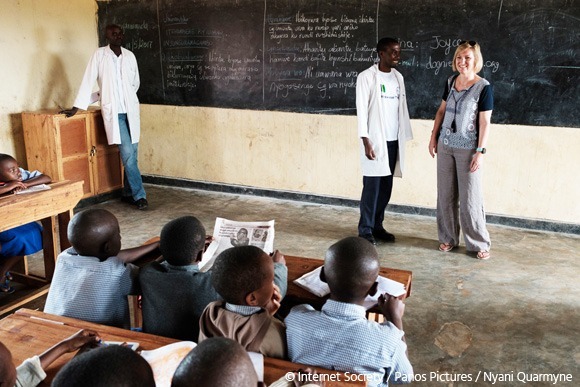 Joyce Dogniez, Senior Director for Global Engagement at the Internet Society, with a teacher during a visit by an Internet Society delegation to Nyirarukobwa Primary School in the Eastern Provice of Rwanda on 11 May 2017. The school says it helped. But with success comes challenges. Now there is not enough space for all the children, so they split the classes in morning classes and afternoon classes and move the computers into the principals office (they needed the computer class to accommodate for classrooms). 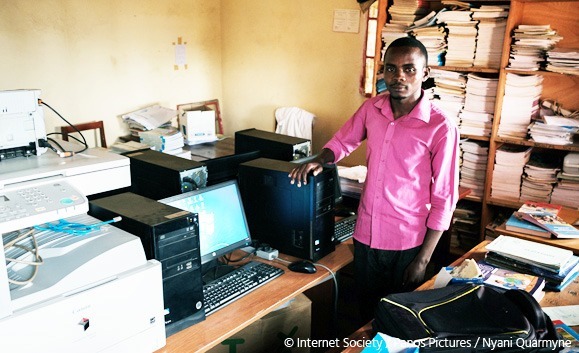 Robert Birushyabagabo, pictured on on 11 May 2017, teaches ICT and maintains the computers at Nyirarukobwa Primary School in the Eastern Provice of Rwanda. Overcrowding at the school resulted in the computer lab having to be converted to the classroom, and the computers are now in a cramped space that was formerly the headmaster’s office. The room is too small to use for teaching, so ICT lessons had to be stopped. And sadly, as the grant funding ran out, they ran out of funding for the Internet connectivity. Our local Chapter, the Rwanda Chapter is working with the school to identify options to restore the connectivity and plan for a sustainable long term solution. This story of one school really shows the impact ICTs have on the quality of education, it shows that if we want to achieve the goals we set ourselves through the UN Sustainable Development Goals to ensure Inclusive and Quality Education (SDG4) we need to push for the use of ICTs and more particularly the use of the Internet. This is also why broader Internet and Education policy plans are necessary. The Internet Society launched a paper on Internet for Education in Africa last week in Kigali during the first African Regional Internet and Development Dialogue providing an overview of the impact of the Internet on education in Africa but also providing a score card for policy makers. Together, let’s make sure that all the Sarah’s of the world get access to quality education by 2030!